Belmont is a town in Belknap County, New Hampshire, United States. The population was 7,356 at the 2010 census. 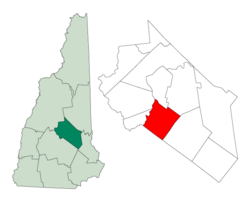 The primary settlement in town, where 1,301 people resided at the 2010 census, is defined by the U.S. Census Bureau as the Belmont census-designated place (CDP) and includes the densely populated portion of the town near the intersection of New Hampshire Route 106 and New Hampshire Route 140. 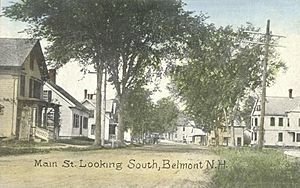 Originally known as "Upper Gilmanton", Belmont was chartered in 1727 as a parish of Gilmanton. With water power from the Tioga River, it developed as a mill town. Built in 1833, the Gilmanton Village Manufacturing Co. made cotton and woolen textiles. Over the years it would change owners, names and products. In 1921, it was the Belmont Hosiery Co., a maker of silk, lisle and woolen stockings. It went out of business in 1955, and the renovated mill building is now a community center. Separated from Gilmanton by an act of legislature, the town was incorporated on 28 June 1859 as Upper Gilmanton. The name Belmont was adopted in 1869 to honor August Belmont, a wealthy financier who (it was hoped) would contribute to the nascent town, but he never acknowledged the act. In 1874, the Boston, Concord and Montreal Railroad passed through the northwestern section of Belmont, and service by the Franklin and Rochester Railroad was being planned. The 1996-1998 adaptive reuse Belmont Mill project, federally funded through Community Development Block Grants, a major private donation and taxpayer support, has been distinguished by regional, statewide and national awards for architectural and preservation excellence. The Belmont Mill story is featured on a NH Historical Highway Marker on nearby State Route 140, and was cited in 2012 by the New Hampshire Preservation Alliance as one of the 25 milestone efforts of a quarter century. The mill was added to the New Hampshire Register of Historic Places in 2014, joining the 1792 Province Road Meeting House on State Route 107, listed since 2003. Other significant historic structures in the town include the Belmont Public Library, included on the National Register of Historic Places in 1985, and the Bandstand, cited for outstanding restoration and rehabilitation in 2015 with the Elizabeth Durfee Hengen Award from the New Hampshire Preservation Alliance. According to the United States Census Bureau, the town has a total area of 32.3 square miles (83.7 km2), of which 30.5 square miles (78.9 km2) is land and 1.9 square miles (4.8 km2) is water, comprising 5.76% of the town. The highest point in Belmont is Cotton Hill, summit near the town's northern border. Drained by the Tioga River, Belmont lies fully within the Merrimack River watershed. New Hampshire Route 106 passes through the town center, connecting Laconia to the north with Loudon and Concord to the south. New Hampshire Route 140 crosses NH 106 at the town center, leading to Gilmanton and Alton to the east and Tilton to the west. U.S. Route 3 and New Hampshire Route 11, forming a concurrency, pass through the northwest corner of the town along the shore of Winnisquam Lake, leading north to Laconia and southwest to Tilton and Franklin. New Hampshire Route 107 crosses the northeastern corner of the town, connecting Gilmanton to the south with Laconia to the north. As of the census of 2000, there were 6,716 people, 2,641 households, and 1,867 families residing in the town. The population density was 219.4 people per square mile (84.7/km²). There were 3,113 housing units at an average density of 101.7 per square mile (39.3/km²). The racial makeup of the town was 97.53% White, 0.15% African American, 0.33% Native American, 0.52% Asian, 0.16% from other races, and 1.31% from two or more races. Hispanic or Latino of any race were 0.95% of the population. There were 2,641 households out of which 32.9% had children under the age of 18 living with them, 56.1% were married couples living together, 10.1% had a female householder with no husband present, and 29.3% were non-families. 22.0% of all households were made up of individuals and 8.0% had someone living alone who was 65 years of age or older. The average household size was 2.54 and the average family size was 2.95. In the town, the population was spread out with 25.0% under the age of 18, 6.9% from 18 to 24, 31.0% from 25 to 44, 25.8% from 45 to 64, and 11.4% who were 65 years of age or older. The median age was 38 years. For every 100 females there were 97.4 males. For every 100 females age 18 and over, there were 93.8 males. The median income for a household in the town was $47,717, and the median income for a family was $53,125. Males had a median income of $35,000 versus $25,882 for females. The per capita income for the town was $19,986. About 3.8% of families and 4.3% of the population were below the poverty line, including 6.5% of those under age 18 and 0.8% of those age 65 or over. Belmont, New Hampshire Facts for Kids. Kiddle Encyclopedia.